Join us this week for Part 2 of our interview with the Indie Rock band, The PondHawks. Hailing from Chicago, IL., the band's catchy melodies are exhilaratingly fresh and Beatlesque. The songs are delightfully infectious with playful lyricism that is exuberant and gutsy. The band's arsenal of music takes the listener on an eclectic journey into Indie Rock spirited by Classic Rock influences that transcend the boundaries of contemporary music. You could say The PondHawks have created a new music genre. The band has a unique retro rock 'now' sound with signature vocal harmonies reminiscent of The Beatles, ELO and Wings. Mario Novelli and Jorie Gracen founded the band back in 2007 and together, write, produce, record, and perform their own music. In March 2010, the band released their critically acclaimed debut album "The PondHawks Have Landed" followed by their second album, a five-song EP called "Dreaming Over Ireland", in May 2012. 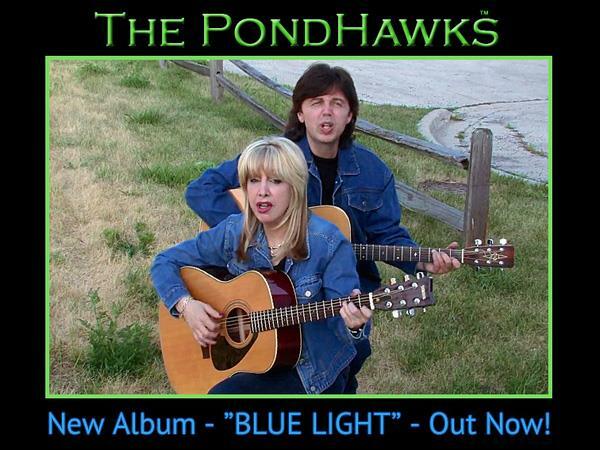 In exciting news for the summer of 2016, Chicago's #1 Indie band, The PondHawks, recently released their much anticipated 3rd album titled "Blue Light" in June 2016 and is available now at all digital oulets. If you missed Part 1 of our live interview with them, a replay can be heard in our show archive. We will talk to The PondHawks about their upcoming schedule, get a behind their scenes look at their music, feature their latest songs, and ask them to share their message for the troops. Please be sure to visit The PondHawks at http://www.thepondhawks.com/ and spread the word. Fans are welcome to call in and speak live with them during the show (718) 766-4193. As always we will give shout outs to our deployed military listeners. Our message to the troops: WE do what we do, because YOU do what you do.